Do you have that one genre of food that hits every inch of your taste buds? A genre that you know you could eat 3-4 (maybe even more) times a week, but you restrain for fear of isolating yourself from the throng of culinary options? Well, I do, and it’s Mexican food. Throw some chiles, cumin, cilantro, avocados…etc etc…into any dish and I’m immediately comforted. Every year for my birthday we have a big Mexican food feast and strawberry cake at my mother’s house. This year, Mom and I teamed up to make a Chicken Enchilada Casserole that was quick, simple, and absolutely delicious. There really aren’t any set rules when it comes to casseroles. Feel free to experiment and add some of your favorite ingredients. Just as long as you have enough sauce covering the tortillas so they don’t dry out, you really can’t go wrong. 1. In a large skillet heat the olive oil over medium high heat and saute the onions until translucent, around 4-5 minutes. Add the next 7 ingredients, through the salsa, and saute until the ingredients are well combined, around 5-6 minutes. Stir in the sour cream and chicken and heat through. Adjust seasonings according to taste. 2. Spray a 9×13 casserole dish with cooking spray. Fill each tortilla with 2 tablespoons of the chicken mixture and roll up like an enchilada. Don’t worry about the tortillas cracking. Once you’ve filled all the tortillas spray the tops with cooking spray. If you have leftover mixture, just throw it on top of the tortillas. 3. Sprinkle the remaining chiles on top of the tortillas along with the shredded cheese. 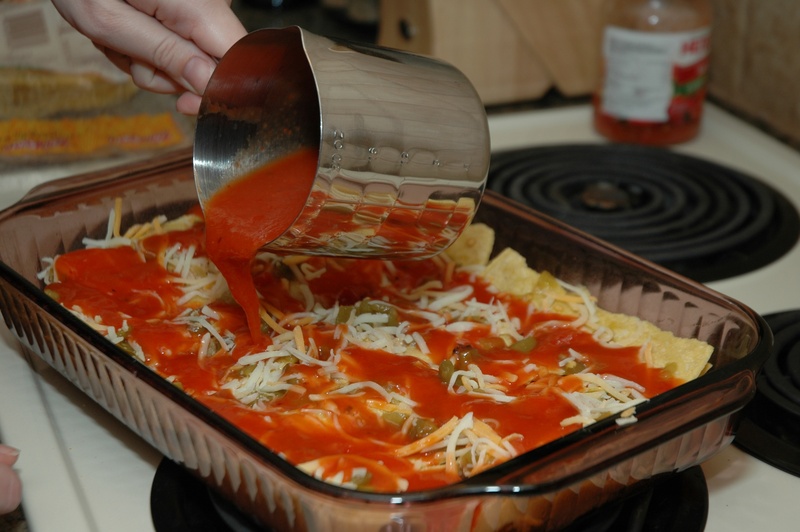 Drizzle the enchilada sauce evenly over the top until thoroughly coated. Bake in the oven 30 minutes until bubbly. The sky’s the limit! Enjoy! I’ve mentioned the fabulous Selah Sue in the ‘Tunes’ section of my blog and she is worth mentioning again. The talented Belgian singer recently released a 5 song EP in the US and I’m loving every minute of it. Do your ears a favor and check out some of my favorite tracks off the Raggamuffin EP. Sarah, I love your Mexican recipes. I’ve added your salsa recipe to my collection. 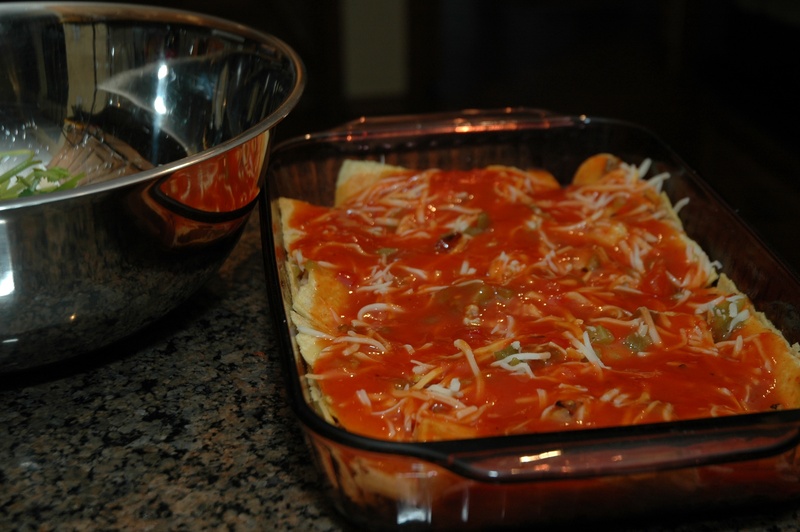 This chicken enchillada one I will make in the next few nights. Spray the top of the tortillas with cooking spray? Really? I have never heard of that! I’ve also made enchilladas with crunchy tops though, so I’m going to try it. I think I’m going to try a torn-up roasted chicken from Kroger or WalMart in this recipe. Lately that’s been my new way to use chicken in recipes. You think it would work okay in this? I’ll bet it would. Thanks for another fabulous looking Mexican recipe! Hi Susan! The cooking spray is just to make sure the tortillas don’t get too crisp, but if you like the edges to be a little crispy then go ahead and omit it. Roasted chicken would be perfect! I have my favorite Rotisserie that I make tons of yummy recipes with. Thanks again for stopping by!